Neighbours star Kylie Minogue created Logies history on the night of the 30th annual TV Week Logie Awards, held at Melbourne’s Hyatt On Collins on Friday, 11 March 1988. The 19-year-old became the first person to claim four Logie trophies on the one night — including the Gold Logie for Most Popular Personality on Australian Television — and the youngest to ever win the Gold before or since. As well as the Gold, Minogue collected the Silver Logie for Most Popular Actress and awards for Most Popular Personality in Victoria and Most Popular Music Video (for her debut single Locomotion). In accepting her award, presented by Hollywood legend Mickey Rooney (pictured), Minogue admitted she hadn’t prepared a speech. “I didn’t because I wasn’t that confident,” she said. “It’s really a great honour. I feel very proud.” She also said she was “just learning” and hoped she could “do the industry proud in some way”. It was a family event for the Minogues, with Kylie’s younger sister Dannii (then Danielle), of Young Talent Time, and parents Ron and Carol also at the presentation. Younger brother Brendan was there in a professional capacity, as a camera assistant for the Nine Network‘s telecast. The other big star on the night was Minogue’s co-star Jason Donovan, winning the Silver Logie for Most Popular Actor. In accepting his award, Donovan dedicated his Logie to co-star Myra De Groot. De Groot, gravely ill with cancer, was determined to leave her bed at the Peter MacCallum Hospital in Melbourne to attend the awards briefly in a wheelchair, but was unable to stay long enough to see Donovan accept his award. The English-born actress who’d worked in the US before moving to New Zealand and then Australia, died only a few weeks after the awards night. 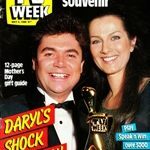 With its popularity at its peak in the late 1980s, Neighbours also collected Logies for Most Popular Drama and Most Popular Program in Victoria. The other big winner on Logies night was the Network Ten mini-series Vietnam, claiming three Logies — for Most Popular Single Drama or Mini-Series as well as individual awards for leading stars Nicholas Eadie and Nicole Kidman. The Seven Network‘s legal drama Rafferty’s Rules claimed two Logies — one for each of John Wood and Catherine Wilkin. The award for Most Outstanding Achievement in News was won by Melbourne’s HSV7 for its reporting of the Hoddle Street Massacre where a single gunman shot dead seven people on a Sunday evening. Seven’s news coverage was commended for its objectivity in dealing with such an emotional story and the manner in which its news team collaborated to bring viewers a comprehensive coverage. ABC‘s long-running current affairs program Four Corners was awarded for Most Outstanding Achievement in Public Affairs for its consistent excellence in covering various social, political and legal issues. Presenter Andrew Olle‘s interview with Prime Minister Bob Hawke was singled out as a particular highlight. The Logies’ industry judging panel also gave special commendation to 60 Minutes for its reports ‘The Miranda Downe Case’ (Ian Leslie) and ‘Goodbye Sunshine’ (Jeff McMullen). The Network Ten documentary Suzi’s Story won the Logie for Most Outstanding Documentary. The program, documenting the death of Suzi Lovegrove from AIDS, screened commercial-free on Ten and had been sold overseas. The documentary also received international acclaim, including the United Nations Human Rights Award for Best Television Documentary. Newcastle channel NBN3‘s The Richmond Vale Railway, the documentary covering the closure of Australia’s last remaining commercial steam railway after 130 years of operation, was awarded the Logie for Most Outstanding Achievement by Regional Television. 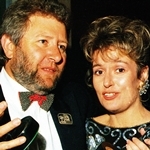 Logies night 25 years ago also created controversy both on and off screen. 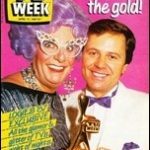 Bert Newton was inducted into the TV Week Logie Awards‘ Hall of Fame but in his acceptance speech made the wry observation that he’d not been employed in television since being dumped by the Nine Network — and being informed of his sacking by a TV Week reporter — three years earlier. It was an acceptance speech that must have struck a chord somewhere as he was soon invited to guest host Nine’s Midday show and the Seven Network ended up making him an offer to front a new daytime variety show. Off camera, at the after party, one of the Logies’ most infamous backstage incidents took place — with Don Lane and Ernie Sigley involved in a heated discussion, leading to Lane throwing a punch at Sigley. Observers of the altercation couldn’t explain what exactly led to the exchange and Lane was seen leaving the party shortly after with no further comment on the incident. Hosting the Logies on its 30th anniversary was Hey Hey It’s Saturday‘s Daryl Somers. As well as Mickey Rooney the Logies’ other overseas guest was The Golden Girls star Bea Arthur. Somers had asked Arthur if she had offers to do other work when she was on a break from The Golden Girls. “No, I’m lucky enough to be stuck in a hit series,” she quipped to a huge applause. 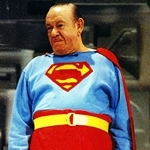 Also to appear on Logies night was David Atkins and his Electric Legs dance troupe — and there was a special appearance by Superman, looking a lot like Maurie Fields. Source: TV Week, 19 March 1988. The 55th annual TV Week Logie Awards. Sunday 7 April from 8pm, Nine Network.